There's a world of music out there. Bring it right into your home, easily, with the SoundTouch 20 system. It works with your home Wi-Fi network and Bluetooth devices so you can play almost anything you can imagine. Plus, it's small enough to place almost anywhere to begin streaming music with full, rich sound. The SoundTouch 20 system is part of an entire family of wireless products for every room of your home. Start with one and add more whenever you want. They all work together to play the same music in every room, or different music in different rooms. A free, powerful app gives you control of it all. Use it to explore millions of songs from music services like Spotify and Pandora, Internet radio stations and your stored music library. And only with SoundTouch can you play any of that music instantly, without a phone or tablet. Press one of six presets on the speaker or remote, and your favorite music starts. It's that easy. Included: SoundTouch 20 system; power cable; USB cable; remote control. Bose SoundTouch 20 Series III Wireless Music System - Black -- Authorized Bose Dealer! Factory Sealed! - Warranty! 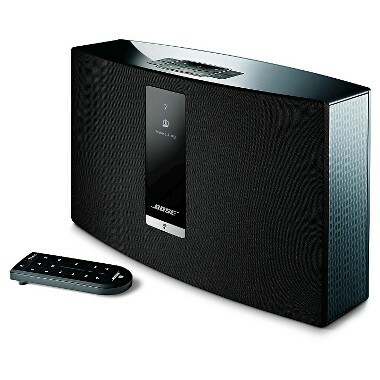 Store: Rakuten.com Condition: Brand New Price: $462.49 Total Price: $462.49 Buy It from Rakuten.com Bose SoundTouch 30 Series III Wireless Music System (Black) W/ Network Cable, AUX Cable, and More. Bose SoundTouch 20 Wireless Speaker -- Free Shipping! Buy Direct From Bose. Bose SoundTouch 20 Series III wireless music system (Black) New Ship Fast!